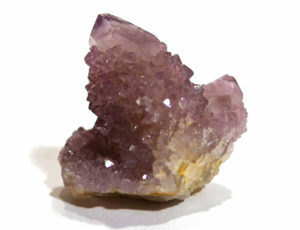 A single large crystal encrusted in tiny crystals, occurring in amethyst (most common), clear or white quartz. The large crystal is said to be the “old soul”, and the smaller crystals are attracted to its wisdom. It is used to provide insight into family or community problems. The term barnacle quartz is sometimes applied, but usually refers to a large quartz crystal with a random arrangement of smaller crystals on one or more faces.